Written by Erick Razo On January 9, 2019. In case you have not watched the news in the last few weeks, there has been a historical happening in the geological and gemological worlds. 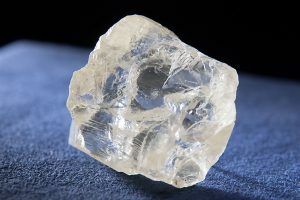 Dominion Diamond Mines, has announced the recovery of the largest gem-quality diamond on record in North America. 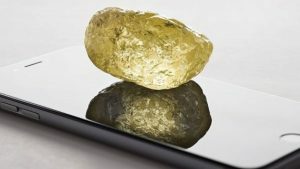 It weighs 552.74 carats and is of yellow color. 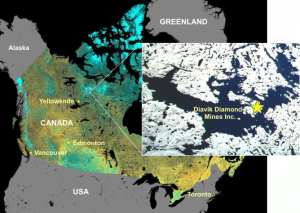 The diamond was discovered in the Diavik mine in Canada’s Northwest Territories in October. 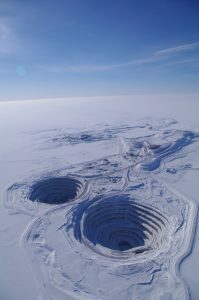 Diavik is approximately 135 miles south of the Arctic Circle, making it one of the most difficult mines to work on during the winter season. The average amount of snow during the winter season is 47.31 inches in Canada’s Northwest Territories. Making the terrain difficult to navigate and very hazardous. 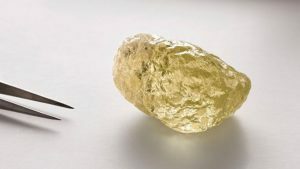 This mine also yielded the previous record holding stone for largest discovered on the continent, the 187.7 carat Foxfire diamond, discovered in 2015. Polished, the Foxfire yielded a 37.87 carat and 36.80 carat brilliant-cut pear shape diamond that went for $1.3 million at auction. The CanadaMark yellow measures 33.74 millimeters by 54.56 millimeters. Marked heavily with abrasions, Dominion said that it won’t sell the stone in its rough form but will partner with a master cutter to cut and polish it. The color and texture of the diamond are a unique example of the journey that natural diamonds take from their formation until they are found. The Diavik mine has produced some of the most beautiful diamonds in the world, and this one certainly tops the list. Written by Sterling VanDerwerker">Sterling VanDerwerker On September 12, 2018. Written by Erick Razo On April 2, 2018. Now that we have learned how to pick out a rough diamond and what makes a standard round brilliant shape, the fun begins! 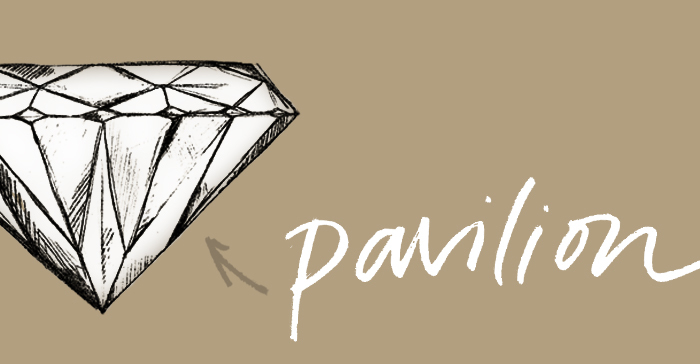 In this blog we will begin to explain the process on how to polish and give shape to a rough stone. However, none of this can happen without the proper tools. 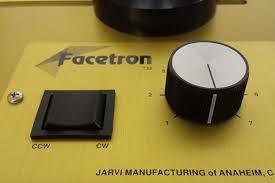 Before we begin doing that, it is highly recommended to take facetting classes. Equipment can be expensive and it is a good idea to find some of this classes to help you try different materials and techniques used to facet a gemstone. 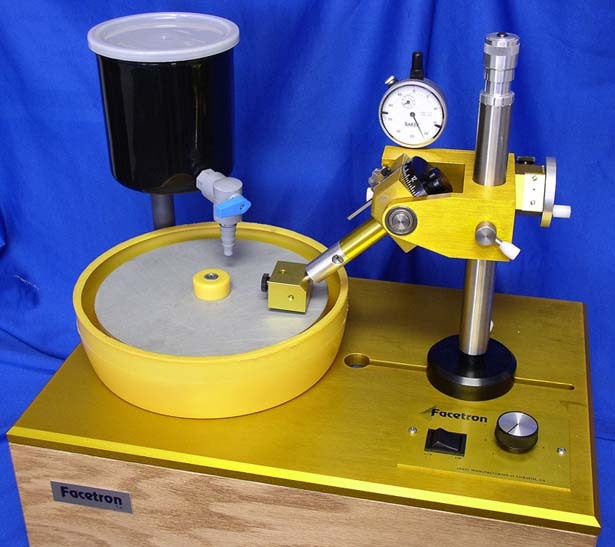 This blog post is to help us understand the equipment used to perform the gem faceting. 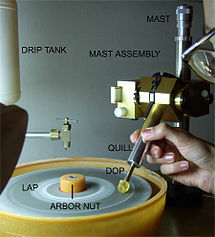 Arbor: Similar to the prong in the middle of a record player that you put a vinyl on, the lap (or grinding wheel) is placed onto it, and the arbor is machined to run perfectly flat when turning. 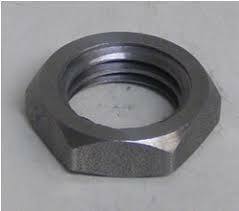 Arbor Nut: The screw that fits through the top of the lap and secures it to the arbor. 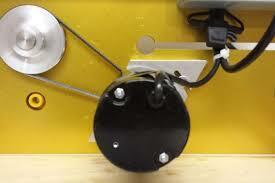 Motor: Typically the motor is housed beneath the machine and is attached by one of several means to the arbor. Motors are always velocity-variable and some can be reversed, i.e. they can turn clockwise as well as counterclockwise. 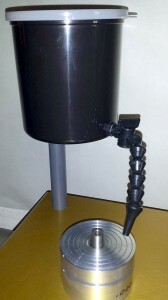 Drip Tank: The drip tank serves two purposes. 1) The friction produced from contact between the rough and the lap creates heat, which can damage the lap and create stress fractures in the stone. The drip tank allows the user to choose a drip rate via spigot and position the spigot over the lap, nearer or farther from the arbor. 2) The dust produced from grinding minerals can cause pulmonary disease if inhaled. The flow of water from the trip tank captures the particles in a slurry, which drains into a rubber container around and below the lap. This container has an exit tube that drains into a second receptacle. Controls: The controls are generally simple and control the rotational velocity of the lap—the key control—and sometimes the direction of spin. Mast: A vertical pole mounted into the base of the machine on which the assembly is positioned. 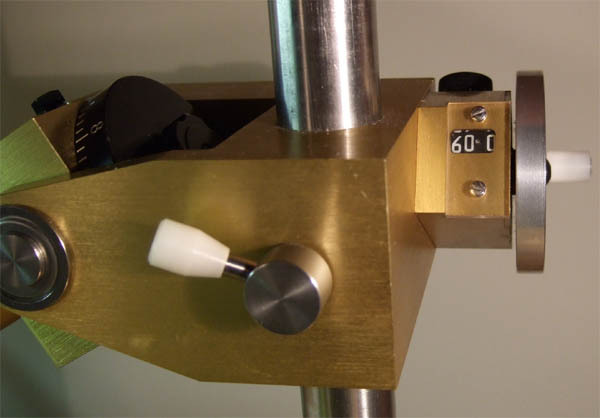 The pole must be machined with extreme care to ensure its perpendicularity to the lap. This is so that, when the angles for facets are chosen, they are placed at the correct angle. Facets at incorrect angles can mean a gemstone that is lifeless or transparent rather than sparkly. Dop: The piece of rough gemstone is glued or attached with hot wax to the end of a brass or steel rod, known as a “dop” or “dop stick.” The other end of the dop is placed into the quill of the faceting head. 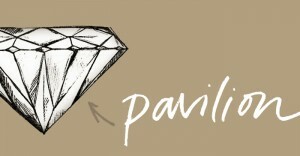 The exposed piece of rough usually becomes the bottom of the stone, known as the pavilion. Once the pavilion is faceted and polished, a jig is used to attach the pavilion to another dop, and the rough side of the stone is freed from its dop. This rough side will now become the top of the stone, or the crown. Quill: The dop is inserted into the quill, which is lowered toward the lap to place a facet. 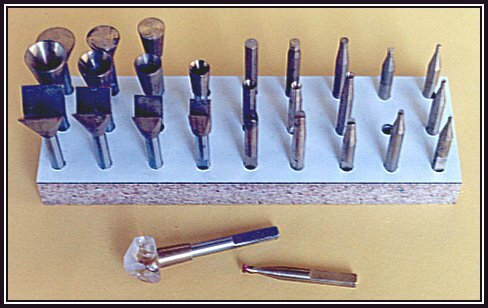 The quill is the part of the machine that is held in the hand during faceting. The other end of the quill is attached to the main head of the assembly. Index Wheel: If you view a gemstone from the top, you will see it has some type of symmetry. Most most round brilliant stones will have eightfold symmetry; emerald cuts have two or fourfold. 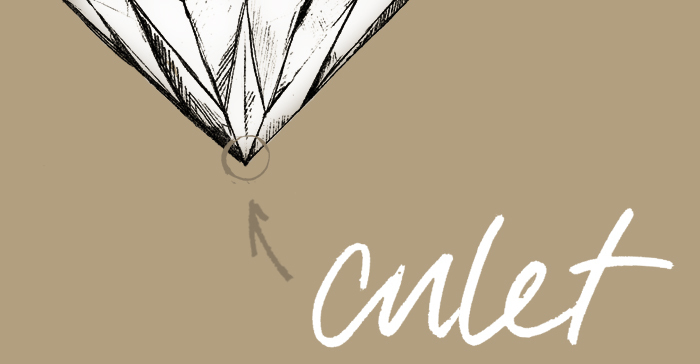 In order to cut facets around a stone, the quill must be rotated around its long axis. The index wheel is what allows this to be done in a repeatable, accurate manner. 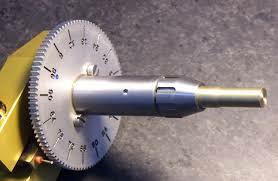 For example, the index wheel may have 64 teeth. 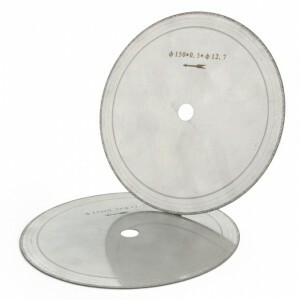 If a round stone with eightfold symmetry is being cut, the index will be set at 0, 8, 16, 24, 32, 40, 48 and 56 for each of the main facets around the stone. If a square stone is being cut, only 0, 16, 32 and 48 would be used. 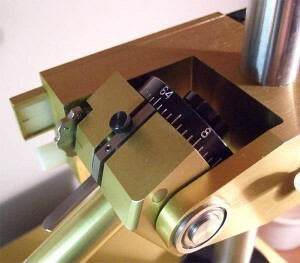 Angle Adjustment: Faceting machines differ greatly in the mechanism for setting the angle of the facet. Essentially, the angle is set and the quill will then lower to exactly that angle before physically being stopped or otherwise indicating arrival at the desired angle. 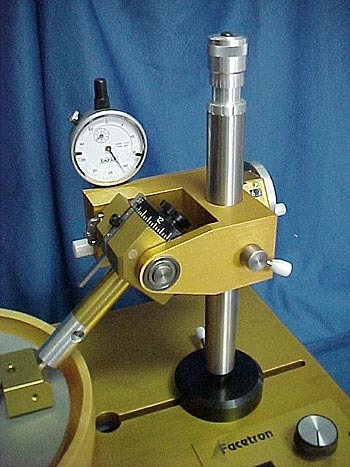 Height Adjustment: The depth of a facet is determined by how high or low the head assembly is, relative to the lap. 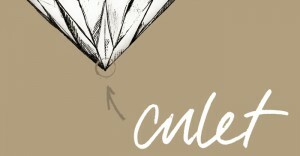 The way this is determined is by choosing an angle, lowering the quill (with dop inserted) to that angle, and then observing whether and how deeply the piece of rough is contacting the lap. Generally the first adjustment will set the rough just touching the lap, so that a very shallow facet will be placed. The head can then be lowered by a micro-adjustment and the facet can be cut and re-cut until it is of a desired depth. Many machines allow the head to be untightened from the mast and slid up and down for gross adjustments, and then have a separate mechanism for making fine adjustments up and down. In the next installment of this blog series, we will begin to explain and look at the cutting process. Written by Erick Razo On February 28, 2018. Which shape is the best? The age old debate in the jewelry industry continues every year as shapes go in and out of style. However, there is one shape that continues to be the most highly sought after and timeless shape of all…the round brilliant cut! 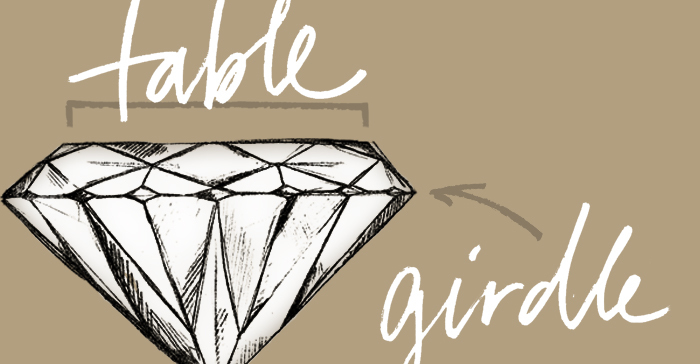 Now, you may be asking “What is involved in a standard brilliant cut?” In this blog we will talk about the history and terminology of the standard round brilliant and how each part is cut to precise measurements that allows the gemstone to perform at its maximum capabilities. 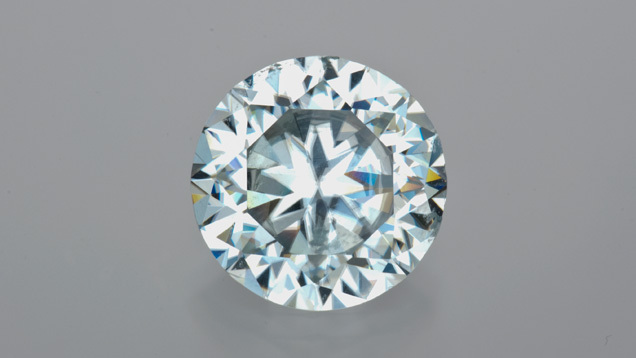 The first faceted stones appeared in the late 14th century. 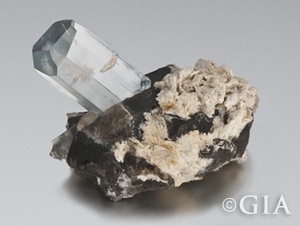 Many lapidaries passed down the knowledge of gem faceting as family secrets. During the 19th century, the art of faceting gemstones became available to amateurs and hobbyists. Fast forward to today and you can find all kinds of literature and videos on how to perform this art. 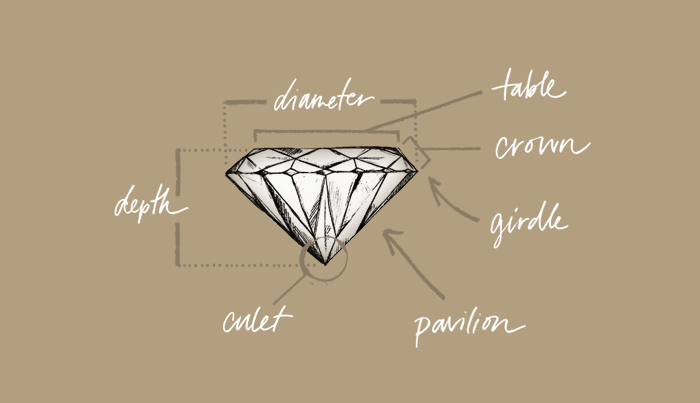 The standard round brilliant begins with the craftsman rounding out the rough stone, then a combination of facets in geometrical patterns are cut around the stone. 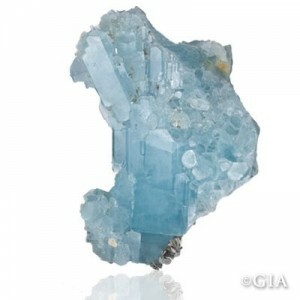 This maximizes the optical properties of the gem and will generate brilliance that is pleasing to any beholder. 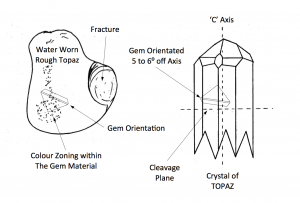 There is a total of 57 facets in a standard brilliant, however, this can vary depending on the stone. 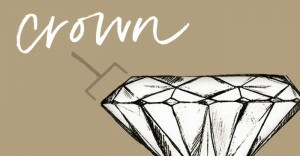 The crown is the top section of the gemstone. 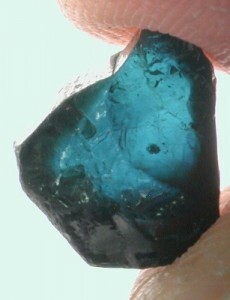 It is approximately ⅓ of the height of the finished gem. 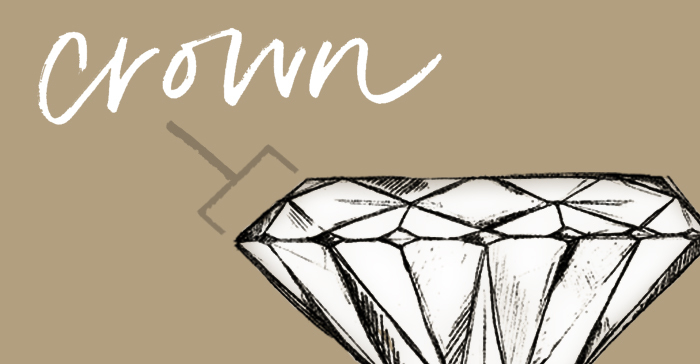 A total of 33 facets make up the crown. The facets are divided into 8 main facets, 16 girdle facets, 8 star facets and 1 table facet. This is the bottom section of the gemstone. It is approximately ⅔ of the height of the finished gem. A total of 24 facets make up the pavilion. The facets are divided into 8 main facets, 16 girdle facets. This is the section of the gemstone that connects the crown and the pavilion. The maximum height of a girdle in a standard brilliant, must not exceed 5% of the finished gem’s height. This is the very bottom point of a gemstone. 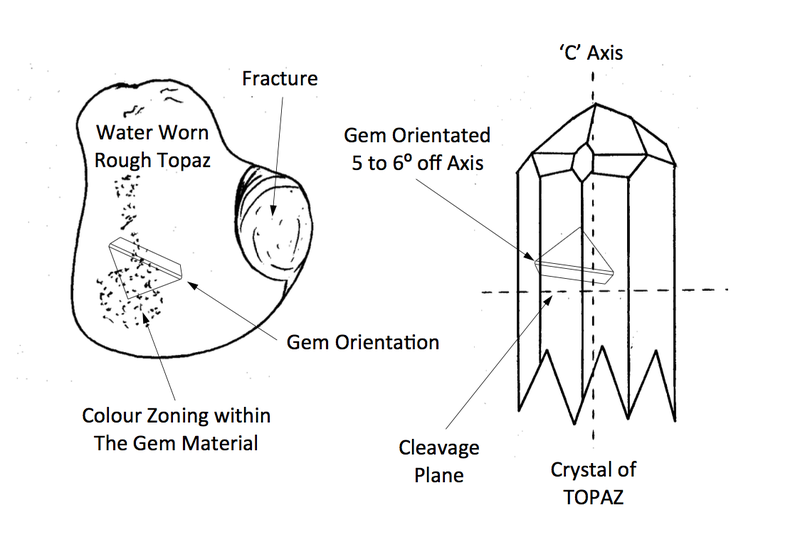 It can be cut as a small, flat facet to prevent the gem from fracturing. This is a common practice to help the durability of stone. There you have it; this is the parts of a standard round brilliant. 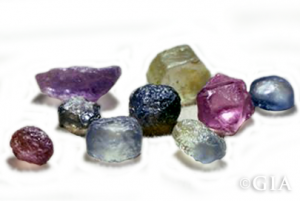 Not all gemstones are cut into this shape, many times the shape is dependant on what type of stone is being cut, and how included the rough is. The decision of what shape to cut the stone into is essential as it will affect all the steps that we will learn about in the next blog post. Written by Erick Razo On February 10, 2018.